We are really proud to note that in early November UCM member Mary Thomas was one of the four ladies from the Parish of the Holy Family in Exmouth to receive the St Boniface Award in recognition of their ministries in the parish. The ladies; Mary Thomas and Bernadette Hughes from St Peter, Prince of Apostles in Budleigh Salterton and Wendy Davis and Mary Jago from the Holy Ghost church in Exmouth were accompanied by Father Philip. Mary Thomas is on the far left. 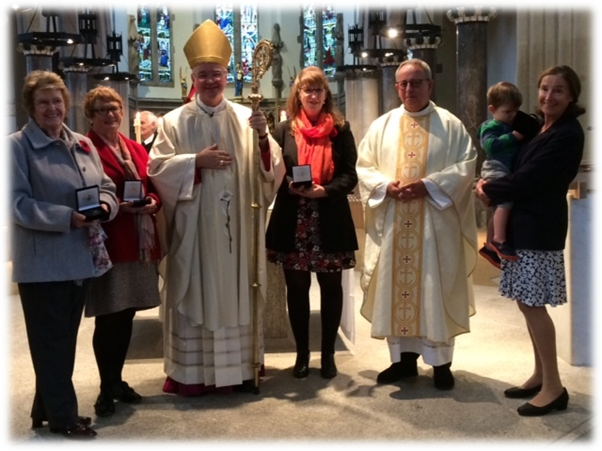 The awards were presented to them during mass at Plymouth Cathedral by Bishop Mark. Bishop Mark invited the recipients forward and handed them their awards and certificates, congratulating them warmly, shaking their hands and thanking them for their service. After the mass the ladies joined in with the other dozen or so recipients from the Diocese for tea or coffee and cakes before returning home.